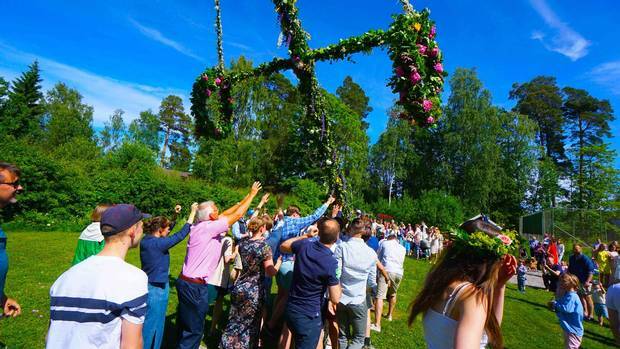 Traditional Midsummer Eve activities revolve around the midsommarstang, the midsummer pole. The Swedes go a touch mad in summer. You really can't blame them, since the season flies by in barely six weeks, and that's if nature is smiling. "Swedish summers are lovely but short," observes my brother, Dr. Michael Forman, who moved to the northern city of Umea from Brooklyn 20 years ago. "Last year, it was on a Wednesday." Brief but intoxicating, Swedish summer is a magical interlude when amber sunlight illuminates the emerald hills nearly 22 hours a day and the air is redolent of wildflowers, transforming Stockholmers from stolid worker bees into sybarites bent on soaking up every bewitching moment. By mid-June, sun-smitten locals have deserted city streets for cottages in the Stockholm Archipelago, about 25,000 islands splaying out into the Baltic Sea at their doorstep. It's something of a mystery how this vast stretch of countryside so close to Stockholm has remained little known to outsiders, preserving an arty vibe akin to New York's 1950s Hamptons. Unpolluted by big-box stores or trendy hotels, it radiates a laid-back twist on Scandi-chic fit for windy days on the water, where locals rock rain boots and slickers with panache, and this year, women are sweeping their hair into 1940s Rosie the Riveter bandanas. People join hands around the midsummer pole for games such as the Frog Dance. Most islands can be reached in an hour or two from Stockholm. Pagan rites subside the next day to respect the inevitable hangover, but on the Archipelago, this otherworldly atmosphere remains for the next few weeks, when the sun barely sets and tawny pink twilight melds into dawn. To locals such as Staffan Wennberg, this unearthly glow is normal: "It's rainy today, but it'll be sunny tonight," he notes without irony. But for a visitor such as me, at 11 p.m., when moody crimson rays still cast an eerie patina on the brick red cottages toeing the shore, my throat tightens in shivery awe. Early evening is a fine time to set out for the Archipelago from Stockholm, since most islands can be reached in just an hour or two, but be ready to surrender the next few days to this province since the seductive sensations of gently bobbling waves and the pleasant prickle of sunlight, enhanced by a peppery tang of the craft beer du jour, may thwart your return. Many Swedes visit cottages on the islands of the Stockholm Archipelago in the summer. Even Vaxholm, just an hour from the city by boat or bus, feels a world apart, with gingerbread fisherman's huts along winding lanes brushing mirror-like inlets barely rippled by swans. Snake your way to Hembygdsgard Café, a hoary cottage with a sprawling garden and a folksy museum. While this popular spot gets raves for its homey fish dishes and water views, I recklessly succumb to the vast pastry table crammed with fantasy temptations such as chocolate marshmallow graddbollar smothered in coconut. Yet, even while recovering from my sugar-drenched bacchanal, I'm lured from my harbourfront rooms at Waxholms Hotell, atmospherically restored with a slipper tub and baskets of dried wildflowers, by a briny scent from below. Following halls lined with century-old photos and stacks of antiquarian books, I arrive at the waterside dining room to find platters overflowing with stromming, Vaxholm's celebrated local herring. Stuffed as I am from my afternoon's indulgence, I'm loath to disrespect a cultural icon and tuck in with abandon. I employ the same rationale to devour a tub of artisanal ice cream from the corner stand: licorice gelato with a shocking herbal salt punch. Sailing is a popular pastime in Sweden. To find the Archipelago's yachty side, I sail to Sandon on its eastern edge, where the village of Sandhamn has two distinct faces: the upper-crust Royal Swedish Yacht Club on one side, and the unpretentious old town beyond Sandhamns Vardshus restaurant, where my meaty local bread is delivered in a brown paper bag. Curious about its source, I climb the serpentine lanes to Sandhamns Bageriet, a bakery thriving since 1850 on the reputation of its marzipan Mazarins, sour cream puffs, and these days, cutting-edge music at night. 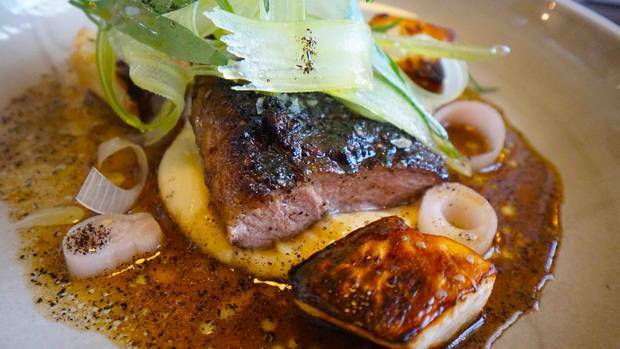 Svartso Krog is a culinary hot spot in the woods. On the backwater island of Svartso – it has a year-round population of 80 and a ferry landing so obscure I nudge the boatman to be sure it's really a stop – I'm astonished to find Svartso Krog, a culinary hot spot in the woods that local foodies try to keep under wraps. Most arrive by boat at the private wharf (I hike a forest path from the ferry) for the chef's reverential treatment of game, vegetables and fruits that retain the vivid favours of preindustrial farming. The meal begins with a plate of rich bread, creamy sauerkraut and farm butter. (I dare you to keep from gorging.) Next come fish and meats sourced from a closely-knit circle of farmers, accompanied by eclectic wines and little-known craft beers such as Monkey Business APA. This restaurant alone is worth a trip to the Archipelago; but remember, you didn't hear that from me. Yachty, foodie and party islands aside, the spot I'd choose to roost for weeks would be far-flung Uto. With the effortless grace of a well-scrubbed natural beauty, this island on the far eastern edge of the archipelago maintains a serene vibe while offering some of Scandinavia's buzziest fashion and food. Lining the harbour are shops such as Hamnmagasinet, a 400-year-old salt shed filled with Scandinavian Indie labels such as Danish Mos Mosh denim, and shamelessly cool rain gear from Ilse Jacobsen. The wheaty scent of fresh bread perfumes the dawn courtesy of Gruvbyn's village baker Tobias Bergstrand, a member of Sweden's national culinary team, who also whips up meal-sized fruit smoothies, sacks of cinnamon crusts and freshly squeezed Scandinavian buckthorn juice, to be consumed while stretching on yoga mats in the yard. Yet, a bike ride through the forest reveals the island's notorious past: 12th-century iron mines excavated dangerously deep for maximum profit. When they were finally closed in 1879, locals held a celebratory dinner, tossing their tableware into the mine pit as a final good riddance. The mood turns joyful farther down the path on the connecting island of Alo, at fish tavern Batshaket. Reachable only by bike or boat, this open-air bare-bench affair is where locals come for smoked shrimp with aioli, "buried" salmon with homemade potato salad and four types of herring. Linger on Uto in the stately guest rooms at Uto Vardshus, the hilltop mansion where Garbo and Strindberg once attended society balls, or in a rustic hillside cottage. But fair warning, this island is so serene that it's perilously easy to lose track of time. You might want to set an alarm for three hours before your flight, which is just enough time to reach Arlanda Airport; or perhaps not.